What is a Tax Exempt Certificate? A tax exempt certificate is a document used by the Internal Revenue Service to grant a tax exempt status to certain non-profit or charitable organizations. A tax exempt certificate is a document used by the Internal Revenue Service to grant a tax exempt status to certain non-profit or charitable organizations. This certificate means that the organization is exempt from paying certain income taxes. The certificate must be presented to the organization or institution in order for them to be recognized as tax exempt. Only certain individuals, nonprofit organizations, and institutions will quality for a tax exempt certificate. Some of these parties include veterans, non-profit or charitable organizations, educational institutions, and some religious organizations. Someone seeking a tax exempt certificate must apply with the correct forms through the IRS. They will need to also provide extensive documentation outlining their organization. This allows the Internal Revenue Service to determine if they qualify for tax exemption. Create a free Tax Exempt Certificate in minutes with our professional document builder. To obtain a tax exempt certificate, you must establish a legal business entity, obtain a tax identification number (TIN), and apply for tax-exempt status. Establish a Business Entity - A business entity is a corporation or a limited liability company (LLC). Both corporations and LLCs are eligible for tax-exempt status. These entities are formed by completing the appropriate business formation paperwork with the secretary of state. The founder of the business can prepare the paperwork directly or use an attorney or business creation vendor to complete the paperwork. An application to form a business will require a unique business name, the founders’ personal information, a business mailing address, initial bylaws, and articles of incorporation. The mission statement and the bylaws of this entity should demonstrate a charitable purpose. Obtain Tax Identification Number - Once a company has been approved by the secretary of state, it will receive state entity paperwork that allows it to go to the IRS website and apply for a TIN. 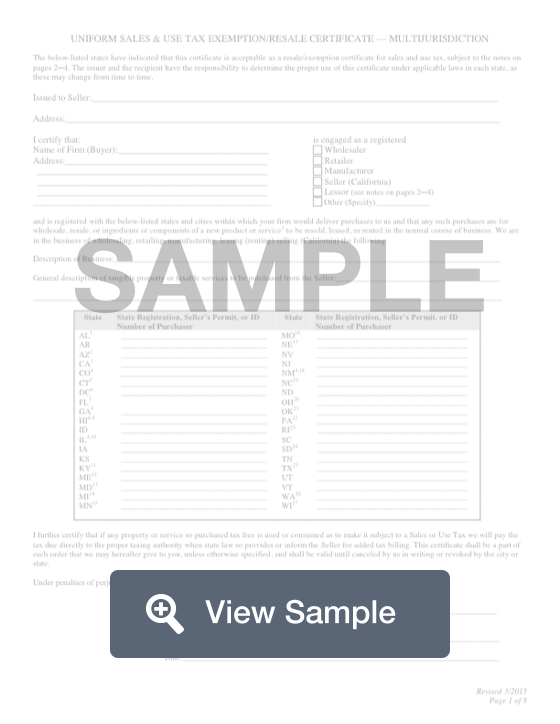 The applicant must use Form SS-4 Application for Employer Identification Number (EIN). Online processing is immediate, faxed applications can take up to two weeks, and paper applications can take up to five weeks. Apply for Tax-Exempt Status - Once a company has received an EIN, it may apply for Exempt Organization (EO) status. There are many different types of organizations that qualify for tax-exempt status. Most charitable, religious, and educational organizations fall under the 501(c)(3) status. Applying for a 501(c)(3) status is accomplished by completing Form 1023. Once you have been approved for tax-exempt status, it is important to maintain complete records, file annual tax returns, and not use the organization for any private gain. If you do not follow IRS regulations, your status can be revoked at any time. Many tax-exempt nonprofits will qualify for sales tax exemption certificates in the state that they are incorporated in. This means that the organization is entitled to make tax-free purchases. When an organization makes a lot of purchases, exemption from sales and use tax can be a huge cost savings. For information about who can use exemption certificates in your state, contact your state department of revenue. Many tax-exempt organizations that deal with sales in different states have problems managing their various tax exemption certificates. Common errors include the tax exemption certificates will be missing a proper signature, missing an issue date, show the wrong State ID, or be the wrong form of document. When these errors happen, you are liable for the tax plus applicable interest or penalties. To avoid facing these penalties, it is important to validate your exemption certificates and know the particular rules in each state. Exemption certificate management is an important part of compliance with tax laws. If you have questions about whether you are in compliance with the Internal Revenue Code, or other federal government rules or regulations, you should seek tax guidance from a professional.